just in time for holiday gift shopping! As I got older, I lost the desire to create puzzles,but I never lost my love for doing them. Just in time for the holiday season, St. Martin's Press has published The New York Times, 'Tis the Season - Crosswords. This is no ordinary crossword puzzle book. The beautiful holiday-themed cover lets you know right away that it is special. And that shiny gold? Yep, I love it! This is truly a book worth keeping, or giving! The sturdy wirebound spine ensures your puzzles stay intact and they give you easy page flipping access too. If you're stumped on any one answer, there is an answer key in the back of the book. There is also a difficulty key to let you know how hard a puzzle is, before you plunge right in. Snowflakes are used as the keys (which I think is oh so cute!). Someone else is going to get to face the same dilemma (hey, that's the kind of dilemma I like) because one lucky winner is going to get one to call their own.. You can learn more by visiting the St. Martin's Press website. You can also follow them on Facebook and/or Twitter. That sounds great. I've been doing crossword puzzles since I was in high school. I'd love this. My father would absolutely love this. He is a crossword fanatic. I love crossword puzzles. This would be a great stocking stuffer for me! I know crosswords are so good for your brain - keep it sharp! My MIL has them handy to stay sharp, she'd love this - will need to get this for her! I love crossword puzzles! I don't do them as much anymore and I don't know why. I used to do them all the time. 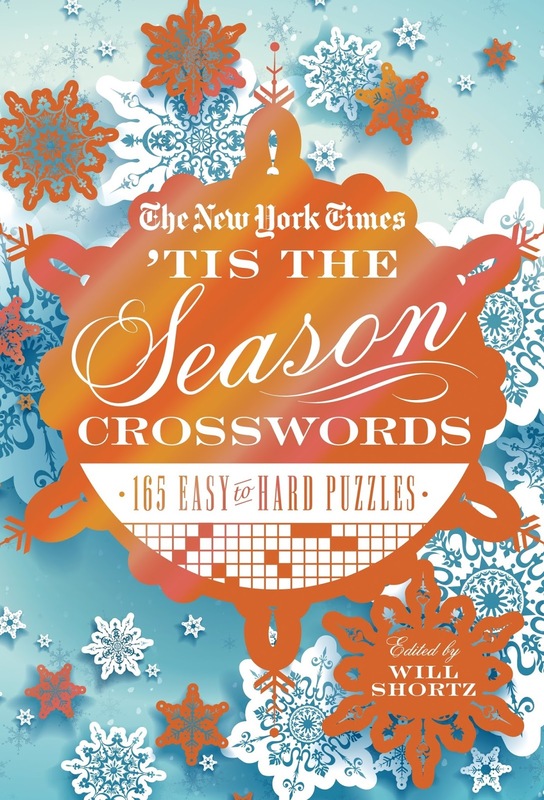 The special crossword puzzle book would make an excellent gift. I would have to get one for myself, too. It is beautiful and an exceptionally nice giveaway for a lucky person. Making crossword puzzles is a difficult task. I love doing crossword puzzles, and my kids do as well. This would make a great stocking stuffer. Crosswords are a good way to distract yourself. I do them when I need to destress. I am not very good at crosswords. This would be super fun to win and get some practice in. Making them is hard, solving them can be as well. I love doing crosswords. How fun! I am not good at crosswords. I don't have the patience for them. It's almost the holidays! I need to start shopping…or winning! My mom would love this. My Mom is a crosswords fanatic. That's one of the reasons she still gets the newspaper delivered. The cover is so pretty. I love crossword puzzles. I am going to add this to my wish list! I love crossword puzzles. And, I agree, it's a great idea for a gift. This would be a great gift for the Holidays. I have a few family members that love to do crossword puzzles. Oh, I love crossword puzzles! I have to spend so much time, waiting around in doctor's offices, and government offices, that crossword puzzles always help me pass the time more enjoyably. I used to do crossword puzzles ALL the time. That sounds like such fun. I love this as a gift idea. I've always loved doing crossword puzzles. Crossword puzzles are so cool! My nana would have LOVED this she did crosswords ALL of the time! My mother love crossword. She will sit and do them all day. I have never been good at crosswords. Ever. But word searches, I'll tear those suckers up! I used to beg for those books all the time! I've been doing crossword puzzles for 50+ years! A reminder that I have not done a Crossword in AGES! Cool book! Perfect for the cold winter months ahead. I absolutely LOVE the spine on it. Easier to write in! This would be perfect for my dad. He does crosswords every day. I love crossword puzzles. I was so sad to hear Merle Reagle died recently, his puzzles for the LA Times were so clever and fun. This would make a great Christmas gift for my younger brother, he loves doing crosswords. This would make an awesome gift for my grandma who loves to do crossword puzzles! My Mom LOVES crossword puzzles--and I am entering this one for her!! Believe it or not at almost 93 she is still doing the weekend NY Times puzzle every week--and finishing them. She would love this book filled with crossword puzzles!! My mom likes to do crossword puzzles and she'd love to have this book. Thanks. This would be great for my mom. She loves crosswords. She used to do the ones other numbers as well. This would make a great gift for my aunt!! Thank you for the chance. Crosswords are fantastic to stimulate the brain. What an awesome giveaway. I absolutely love to do crossword puzzles. It's good for the brain. I love love love crosswords. Merry Christmas to me! I know someone this would make a good gift for. My mother loves crosswords and does at least one every night before bed - this would make an awesome gift for her. I love doing crossword puzzles. This is the ultimate gift for a crossword puzzle lover! I love crossword puzzles! This book looks like a lot of fun to do! Thanks so much for hosting this giveaway! I need this--I am having crossword puzzle withdrawal lately. I love hard crossword puzzles and a fan of Will Shortz since his days at GAMES magazine. My husband loves to do crosswords. I love to do crossword puzzles. Challenges my mind!